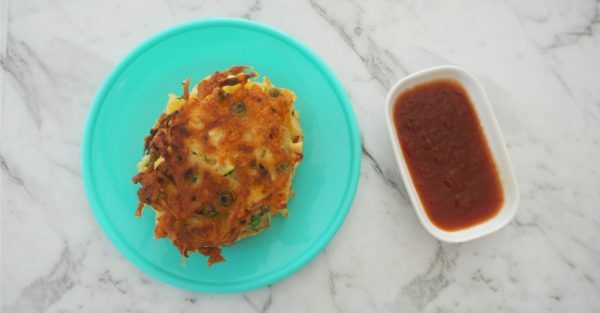 If you are looking for a great way to up your families vegetable intake, this vegetable fritter recipe is for you! These easy vegetable fritters are packed with flavour (and veggies!) and they make a great easy meal or lunchbox snack. You can also use a variety of vegetables when making these fritters (sweet potato and broccoli is a REALLY yummy combination too!) and they are also freezer friendly. Step 1. 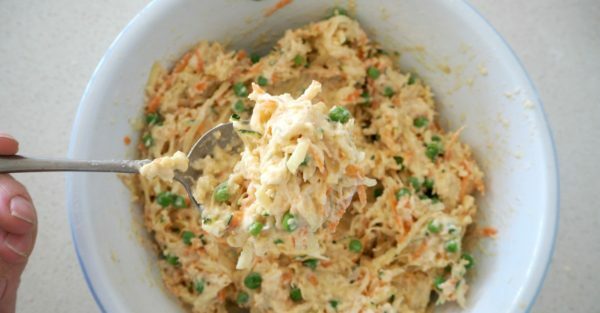 Grate the potatoes (unpeeled), zucchini and carrot into a large bowl before adding the peas. Step 2. 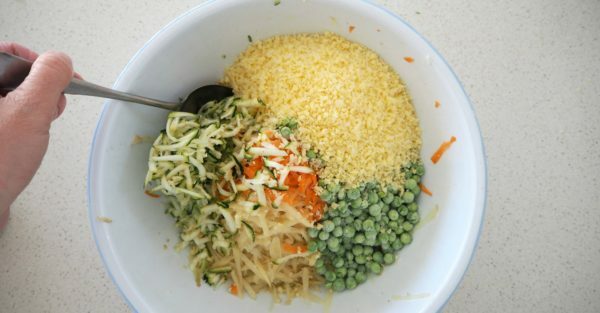 Grate the parmesan and tasty cheese into the bowl with the grated vegetables and add the onion flakes and crushed garlic before stirring to combine. Step 3. Add the self-raising flour. Step 4. Beat the eggs in a small bowl lightly with a fork and add salt and pepper to taste. Add the eggs along with 1/2 cup of water to the bowl with the vegetable mixture and stir. Gradually add the extra water and stir until you have a thick batter – please note you may not need all of the water depending on the size/water content of the vegetables that you used. Step 5. Heat a tablespoon of olive oil in a large frying pan over a medium to high heat and use a 1/4 measuring cup to scoop up the batter and place the fritter mixture into your pan. Use a spoon to gently spread the mixture into a circle between 1/2cm – 1cm thick. You should be able to fit approximately four fritters (or even more depending on the size of your pan) into your frying pan. Step 6. 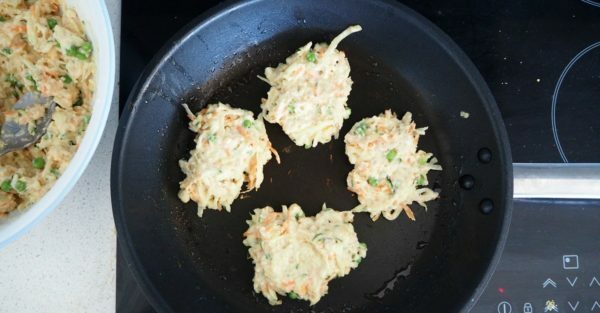 Cook the Vegetable Fritters for 3 – 4 minutes on each side until they are crisp and golden brown before transferring to a plate and covering them with foil so they stay warm while you cook the next batch. Repeat until all the fritters have been cooked.